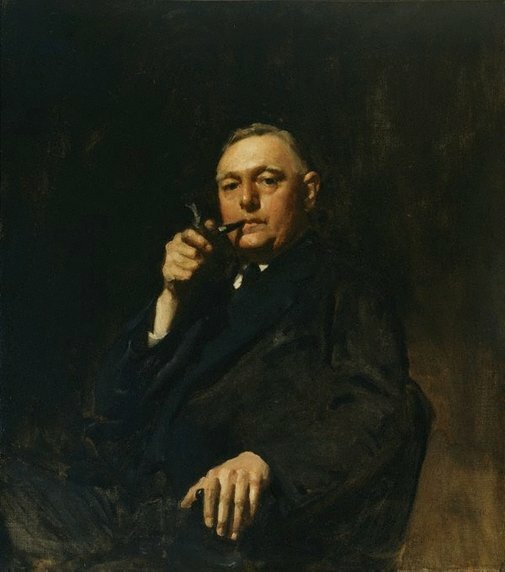 Sydney Ure Smith (1887–1949) was influential in promoting Australian art to a broader public during the first half of the twentieth century. In 1906 he founded the advertising company of Smith and Julius, incorporating quality art and design with technically advanced printing. He then founded the periodicals 'Art in Australia' (1916) and 'Home' (1920) and established the publishing company Ure Smith Pty Ltd in 1934, producing numerous texts of key significance to Australian art. President of the Society of Artists 1921–48, trustee of the Art Gallery of New South Wales 1927–47, patron of many artists, and active in numerous positions of influence, he was himself a competent practising artist. This work was a finalist in the 1922 Archibald Prize and was acquired by the Gallery in 1929. William Moore, The story of Australian art from the earliest known art of the continent to the art of today (Vol. 2) , 'The boom', pg. 25-45, Sydney, 1934, (illus.). Jean Appleton - A lifetime with art , Sydney, 1998, 22 (illus. ).